So for this dish, you can roast a whole chicken and debone to use the chicken in the recipe.... or you can take the easy route and use a store bought rotisserie chicken instead. I got about 3 cups of chicken, which was perfect for this recipe. 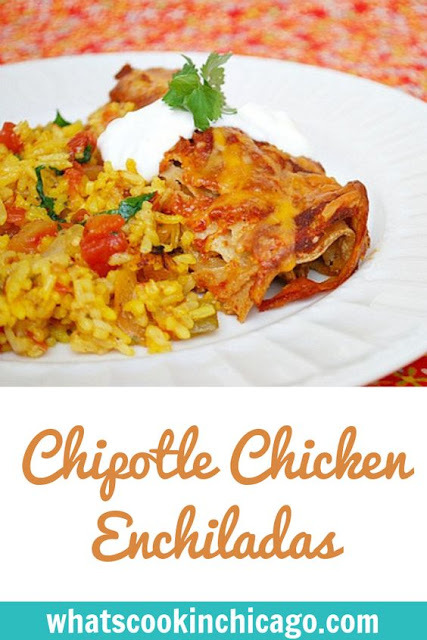 However if you want more chicken in each enchilada, use 2 rotisserie chickens which may yield about 6 cups after deboning. The chipotle sauce was nice and zesty with a bit of kick. You can hold back on the chipotle if you want it more on the mild side - adapt it to your tastes! I included the make ahead directions below within the recipe too if you want to make this to freeze and enjoy later. 12 medium-sized corn tortillasPreheat the oven to 350F. 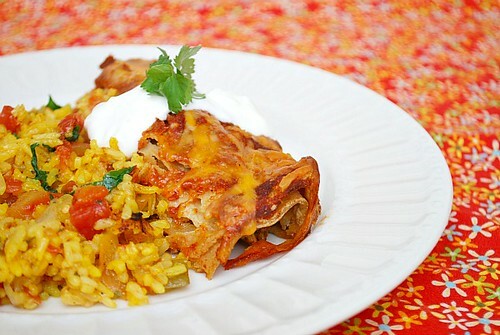 In a large bowl, combine the shredded rotisserie chicken, 1 1/2 cups enchilada sauce and 1/2 cup shredded cheese; set aside. In a medium saucepan over medium heat, add oil. When oil is hot, add flour and stir with a wooden spoon until mixture is smooth to create a roux. Stir in the dry spices to the roux and add in chipotle peppers, tomato paste, chicken stock and salt. Stir to incorporate all the ingredients in the saucepan and bring to a simmer, lower heat and cook for 10-15 minutes, until slightly thickened. Spread about 3/4 cup sauce over the bottom of a 9x13 baking pan , or if freezing as a make ahead meal, use a disposable aluminum pan or a microwave/dishwasher/oven safe baking pan. Place about 1/4 cup of the chicken mixture (or a little less) in each tortilla and roll it up like a cigar. Place in the baking dish and repeat with all remaining chicken and tortillas to create an even layer of rolled tortillas on the bottom of the pan. Top with remaining enchilada sauce and sprinkle cheese over the top. At this point, you can cover and freeze the dish as a make ahead meal. Otherwise, cover the baking dish with aluminum foil and bake for 20 minutes. Remove foil and bake for an additional 10 minutes. Allow to cool for at least 5 minutes before serving with guacamole and sour cream. To bake the freezer meal, defrost completely and bake as directed above. I feel like I always have chipotles in adobo, except for right now! I'll have to save this for when I have them. Do you have the recipe for your rice as well?